Photo courtesy of Jim O'Connor and USA TODAY Sports. Fred Van Vleet in the lineup? No sweat for Seton Hall! Although Van Vleet posted a game-high 19 points, it was not enough for the Shockers to top the real studs of New Jersey. NEWARK, NEW JERSEY---2 weeks ago, the Wichita State Shockers were in a position unlike any during the Ron Baker-Fred Van Vleet era. To elaborate, for the first time in the two's four-year tenure, Gregg Marshall's squad possessed a losing record (2-4). Then, with the return of Van Vleet from injury, everything returned to normal and the Shockers began to collect resumé victories. Despite a combined 48 points from one of the best backcourts in the country (Baker, Van Vleet, and Conor Frankamp), Wichita State was taken under on the high seas (Newark, New Jersey) by the Seton Hall Pirates' "stud sophomores" 80-76 in overtime. Trading deuces for the first 3:40, the Shockers threw the first punch while silencing the fans donning blue with a 12-2 spurt spurred by, you guessed it, Fred Van Vleet. The two-time All-Missouri Valley Conference First Team selection was instrumental in the pull away as he nailed two triples in less than 60 seconds, the second of which provoked a Seton Hall 30-second timeout (13:05 remaining in 1st half). Now there was good news and bad for Pirates' head coach Kevin Williard and him calling a timeout. On a positive note, the timeout served as a wake-up call for his young, talented squad's offense. However, their defense was still sleeping in the dorms, for Wichita State was able to get any shot they desired. Van Vleet with a layup? Of course! Ron Baker from downtown? You know it! The Shockers were finally looking like their old offensive self. Nevertheless, Wichita State was never able to pull away. In fact, despite owning a 13-point advantage at the 6:34 mark, the mid-major powerhouse found themselves ahead only eight (40-32) heading into halftime. Exiting the intermission, the Shockers increased their advantage to 11 during the first seven minutes thanks to triples from each Evan Wessel, Rashard Kelly, and Fred Van Vleet (49-38 WSU with 13:30). It was now fight or flight time for Seton Hall. Unlike the previous half, coach Williard decided against calling a timeout and instead let his team play out of their funk. Talk about a great decision! Like flipping a switch, the Pirates intensity rose, not only on offense but on defense as well, for they strung together six unanswered. 49-44 Shockers! Following a jumper from Kansas transfer Conor Frankamp, Seton Hall continued to get defensive stops while utilizing a 11-3 wave of baskets to plunder a 55-54 lead. 55-54 Seton Hall? The Pirates were in control? Not exactly. Breaking exactly a four-minute scoring drought, Frankamp was able to draw a foul and make two attempts from the charity stripe. 56-55 Wichita State! Additionally, the sharpshooter nailed two unanswered treys to supply the Shockers with a 62-55 edge with 4:48 left in regulation. Unfortunately for Wichita State, Seton Hall would not go away! "Stud sophomore" Desi Rodriguez was able to produce five unanswered to somewhat match Frankamp's seven. 62-60 Shockers! Although Baker was able to get free for two on the ensuing possession (64-60 WSU), Isaiah Whitehead tickled the twine from outside before Derrick Gordon added a layup, ultimately taking back the edge (65-64 SH). From there the two teams made only free throws for the next minute and 28 seconds (3 by Wichita State and 2 from Seton Hall) until Whitehead attempted a game-winning attempt. Off the mark! We were heading to overtime! In the extra segment, Van Vleet swiftly took the lead for his team with a three pointer. Though, that would be the only Shocker points for the next 3 minutes and 14 seconds! Did the Pirates capitalize on Wichita State's drought? Of course they did as they went on an 8-0 victory-clinching spurt to literally "shock" the Shockers. No really, Gregg Marshall seemed in a state of disbelief with the fact that his team allowed an 11-point second half lead and a 7-point advantage with 4:48 remaining in the 2nd half to get away. Sail on Pirates! 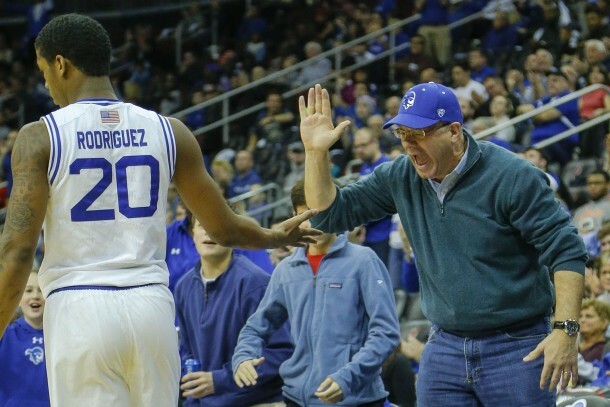 Starting an all-sophomore lineup for now nine of eleven games this season, the Seton Hall Pirates have had much success while playing a youth-filled lineup. This afternoon was no exception. Averaging about 56 points per contest, Whitehead, Khadeen Carrington, Rodriguez, Angel Delgado, and Ismael Sanogo "upped the ante" with a combined 65 of their team's 80! In other words, there is no doubt they are ready for Big East play when it commences on December 30. Today was more than just a loss for Gregg Marshall and Fred Van Vleet's Wichita State Shockers. Furthermore, it ripped away any chances of them receiving an at-large bid on Selection Sunday. A big point that has been emphasized by many men's basketball experts is all three losses in Orlando (USC, Alabama, and Iowa) came without Van Vleet. But, with today's loss it contradicts the point that those defeats would not have come with him on the court. Take it from this journalist, a hobbled Van Vleet (which would have been the case) would not have made a difference at the Advocare Invitational, especially in the blowout to Iowa. All in all, with the probability of the Shockers receiving an at-large bid with this year's competitiveness and great quality of other mid-majors (Monmouth, Texas-Arlington, and Valparaiso for example), they must go undefeated in Missouri Valley Conference play (in order to bring themselves back into the spotlight) or win "Arch Madness" in St. Louis, something they have only done once with Baker and Van Vleet, to be "dancing" for a fifth straight season.